Shortly before 5 p.m., the vehicle and the motorcycle collided in the southbound lane. Emergency personnel transported one victim to an area hospital. One lane of Highway 101 was closed and traffic was backed up for about an hour. Another Caltrans death at a very well know, documented and minor mitigation completed location. The good news, per the Caltrans criteria, each death moves a frontage road closer to fruition. Remember the highs-peed rail to no where, already has cost over runs that will fund Feinstein’s husband and on it’s first run, if we are counting, a life cost equivalent to many fully loaded box cars of bodies. As much as Caltrans maybe responsible for addressing the unsafe location lets not miss that the driver of the BMW appears to be responsible for this terrible accident. Even thought the intersection may create a situation where drivers become impatient waiting for it to be clear, it still is the driver who makes the unsafe maneuver. You are absolutely correct, as it is for driving on the wrong side of the road, as done on Highway 46 and Highway 166. Big bucks are being spent to make it safer for the tourism dollars that depend on those highways but for we locals, our stretch of the commuter highway has become victimized by restaurant and motel dollars. Highway 101 has a couple of well documented seriously dangerous cross traffic and pedestrian stretches. As a result, liability checks are written in lieu of funding the needed mitigation. Please understand that the Voters provide this liability fund because the fix competes against other projects that the Voters elect. The BMW driver, a 42-year-old man from Arroyo Grande, was not injured and not arrested. Who is this driver? What member of the local power elite has been given the free pass on a negligent killing?! Sad! But not everything is a conspiracy. 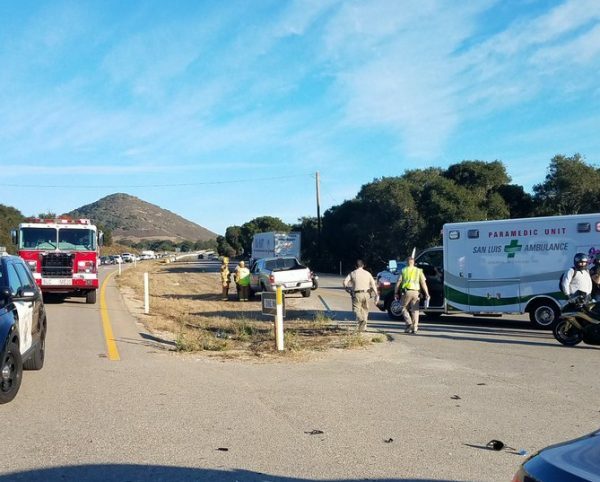 To more accurately quote KSBY… “Officers said that a BMW sedan was driving east on El Campo Road when the driver attempted to make an unsafe left turn in front of the motorcycle. The motorcyclist slid into the left side of the BMW.” Perhaps stupid and negligent…but illegal?!? I think that’s for the CHP’s investigation to decide. How in the world can someones negligence behind the wheel of an automobile that results in a tragic death and not even get so much as a traffic ticket is beyond comprehension. Maybe you could picture El Campo Road. Then you would realize (from the picture accompanying the article even) that left turn was ONTO the FREEWAY. He jumped out in front of freeway traffic and killed someone. He didn’t flip someone off, but KILLED an 18 year old. I came home past this wreck before it was even cleaned up. It didn’t happen on El Campo. Nice job cut and pasting the full quote though. Failing to yield the right of way is against the law. When it results in a death, it constitutes a much higher level of ‘naughty’ Mort. I would have been arrested and so would you. My sincere hope that you will love the taste of the crow. Not everything today is NOT not a conspiracy either. Waste of words.